EUGENE — The gulf between Oregon and Oregon State football grew even wider Saturday in the cold chill at Autzen Stadium. A year ago, after Oregon State ended eight years of Civil War futility ended with the Beavers' 34-24 victory, Gary Andersen seemed to be making headway in his bid to build a program that could annually contend for state supremacy. On Saturday, with Andersen long gone and Willie Taggart now manning the joystick for Oregon, the difference between the programs proved Grand Canyon-sized. Call in the Great Divide. The final tally — Oregon 69, Oregon State 10 — was emphatic, but anticlimactic. The Ducks, sharks circling in bloody water, scored on their first seven possessions and led 52-7 at halftime. By that time, the Oregon players on the sidelines and students in the stands had almost grown tired of their cheesy swag-surfing routine. Many of the partisans chose to leave the stadium at halftime, even in light of the pounding the home team was giving the visitor. The Duck mascot wore himself out doing pushups after every touchdown. It was a humiliating scene for the Beavers, even after a humbling 1-11 season. "We got beat in every facet of the game," said OSU senior linebacker Manase Hungalu, the Beavers' best player this season on either side of the ball. "We weren't executing what we planned on throughout the whole game. There were a lot of little things that did not happen. There was no communication out there. "We have to put people in the right place, and those players have to be able to do their job and make a play. We didn't do any of that today. It's been going on for the entire year." But not to the degree that it did Saturday as the Ducks rubbed it in their faces. 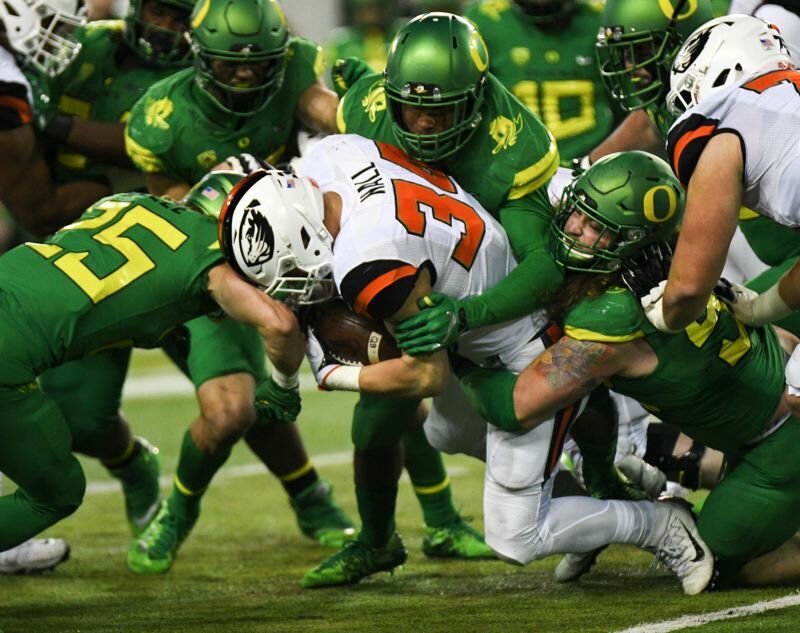 It was the most one-sided loss in the 121-year history of the rivalry, worse than Oregon's 44-0 whitewash of the Beavers in 1987. It was the most points ever scored by one team, more than the Ducks piled up in a 65-38 beat-down at Reser Stadium in 2008. "I feel like we were pretty motivated," OSU redshirt freshman Kee Whetzel said. "Last game of the season. Civil War. It was a 'we've got nothing to lose' type of thing. "But things didn't go as planned. I don't even know what to say. No words to explain that kind of performance." Oregon State managed only 211 yards total offense and 98 yards rushing. "It boils down to execution," said junior Ryan Nall, who gained only 41 yards on 14 carries. "It feels like we're playing a broken record — talking about not executing. But if we do execute and stick to our game plan, it's a different Beavers team, I promise you. "It was hard for us to get a push up front, but (the Ducks) executed their game plan, and we didn't. That's what it came down to." Cory Hall — five days after the birth of his eighth child, son Isaiah — chose to keep the positive face he has maintained since taking over as interim coach when Andersen quit at midseason. Did he see the blowout coming? "Absolutely not," said Hall, who coaches the OSU cornerbacks. "But as you get into the flow of the game, you could see where things were going." Why did it get out of hand? "Your guess is as good as mine," Hall said. "It was Oregon. (The Ducks) did what they came to do, and they were successful at it. "But I'm very proud of the players. They stuck together. There was never any back-biting. They showed up every day. They wanted to work. I couldn't have asked for more. It's been a blast. I enjoyed every minute of it." But things were awry for the Beavers all season, beginning with the opening 58-27 defeat at Colorado State. The loss of quarterback Jake Luton and No. 1 receiver Seth Collins for most of the season crippled the offense, and the defense proved the most porous in the Pac-12. Was Saturday's debacle a reflection of the OSU coaching staff? "Honestly, they put us in the best position that they could," Hungalu said. "As players, we just didn't take the next step working on ourselves, getting into the video room, doing the little things that matter. We didn't prepare enough. We took practice lightly this week. "Preparation is the biggest key in playing this game, and that didn't happen. That's probably why we had the results we had." Hungalu mostly pointed the finger at himself and the Beavers' other seniors. "We didn't step up and lead," he said. "We didn't have that. A lot of guys just were thinking after this game, they were just going to go home and leave. We had the wrong mind-set walking into this game. A lot of people think you can just walk into a game and be able to perform. There's a lot more to it. We didn't prepare right. "We definitely had more than we showed today. We didn't take the preparation seriously. We weren't doing the right things in practice, and all of us — me, too — expected to go out there and play a lights-out game." Hungalu praised Hall for coming in "with the right energy and mind-set to get the players to turn things around." But he felt the Beavers required more. "We needed that extra next step of coaching," Hungalu said. "We needed a coach able to demand perfection from players, instead of just telling them to go out there and play your game, to do your thing. We can't have one half (of the lineup) playing good and one half not playing good, because they don't know what to do on the play. That's inexcusable. "But the players have to be able to take it to another level. They can't expect to rely on the coaches all the time." Andersen didn't prove to be the savior he was made out to be when he arrived from Wisconsin before the 2015 season. Hall was a worthy temporary replacement, and everyone wants him to be part of the next coaching staff, though he won't be the head coach. The new coach, who will be hired in the next two weeks, will not inherit an empty cupboard. Luton and Collins will be back, and so might Nall, if he chooses not to graduate transfer or move on to the NFL. Running back Thomas Tyner can apply for an additional season of eligibility due to medical redshirt if he chooses. There are solid players in the sophomore and freshman classes, plus more than a dozen promising freshmen who redshirted this season. "There's a lot of talent coming back that you'd be able to win with," Hungalu said. "We have a lot of potential," Whetzel said. "We have some good recruits coming in. We'll be able to come back better and stronger next year." Depth will be an issue. The new coach will have to buttress the nucleus on hand with some junior-college help. He'll have to keep the bulk of the 13 prep seniors who have given verbal commitments and add to that by the Dec. 20 letter-of-intent signing period. The competition in the Northwest is fierce, with Oregon rebounding and Washington and Washington State knocking on the door of greatness. Slipping further behind is something the Beavers can't afford to do. The good thing is, the season that wasn't has finally passed into history. "(The year) 2017 is dead and done away with," Hall said. "Now you push to a new birth. (The year) 2018 will not be anything like 2017. The future is bright for the young guys who are here. They have bigger and better things to look forward to." There's only one direction to go after what happened at Autzen on Saturday.